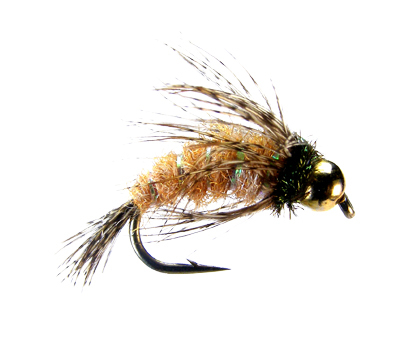 When the first leaves fall off the deciduous trees at the beginning of fall, fly anglers should begin preparing for the arrival of the giant tent winged caddisfly. For it will become a major player on the trout’s food menu from September into November depending on your geographic location where it thrives. For western fly fishermen we’re talking about the October Caddis “Dicosmoecus”, and for eastern fly fishermen we’re referring to the Great Autumn Brown Sedge “Pycnopsyche”. You could argue that these guys are twins, because they’re similarities in life-cycle, behavior, hatch periods, and appearance are almost identical. 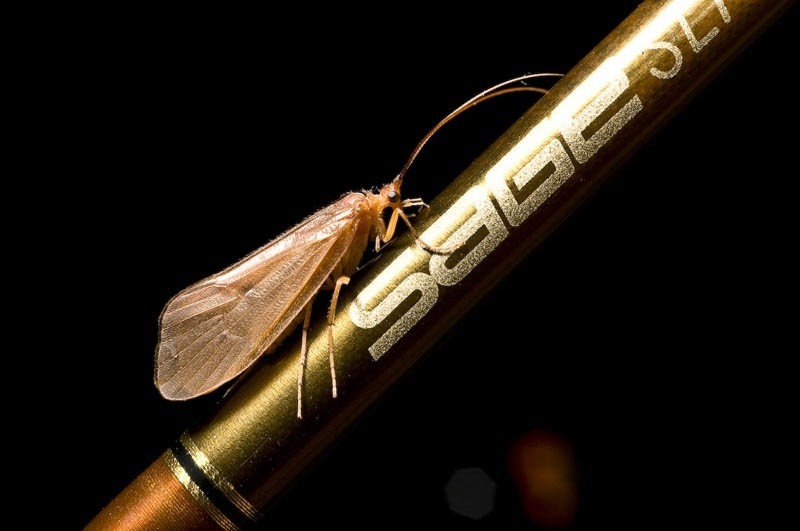 The great fly fisherman and author, Gary LaFontaine, rated the October Caddis as one of the four best aquatic insects for offering anglers the opportunity to catch a trophy trout. He devoted a significant section of his book “Caddisflies”, to the October Caddis, detailing its behavior, life cylce, and effective fly pattern imitations. Over the years I’ve had mixed results targeting this hatch. Big fish have been landed at times, while at other times on the water I’ve felt like trout weren’t even aware these guys existed. It’s only in the last two seasons that I’ve corrected my flaws and learned to fish the hatch correctly. The key success factors in fishing this hatch are understanding it’s behavior, and fishing the appropriate larva, pupae, and adult imitations during the right times. If done incorrectly, anglers will find this hatch difficult to decode. Let’s get started by giving you a basic run down of the life-cycle of these two bugs. The first thing you need to understand, are these species of caddisflies time their hatch specifically during the annual leave droppings of fall. The freshly hatched larva from deposited eggs depend on the abundant leaves collected in the water as their primary food source. Anglers wanting to capitalize on this emergence from the very beginning, need to start fishing larva and pupae patterns when the leave drop begins. The Giant Sedge and October Caddis begin their larva stage as case dwellers made primarily from wood fibers but in some cases gravel as well. In August, they both abandon their stick cases and move to sections of fast water for pupation. They generally relocate under flat rocks and seal themselves in a stone casing for their final metamorphous stage into adulthood. When pupation is complete, they begin to emerge by building up gas bubbles under their skin, which aides in floating them to the surface and begin drifting in some cases long stretches of water, before finding shallow water where they primarily crawl out and hatch. Although the majority of them crawl out and hatch there are significant numbers that float to the surface and hatch mid-river. Depending on where you live emergence can occur from Mid-September into November, but one thing both species have in common, is they’re always consistent with choosing a peak activity of hatching from late afternoon until dark. That being said, anglers fishing this hatch should concentrate fishing imitations during the evening and early morning hours, slacking off during the middle of the day unless you find your in an area where the hatch is so significant the fish key in and will feed on them all day. 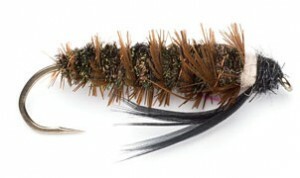 I begin fishing the early phase of this pre-hatch by nymphing a tandem nymph rig with a pupae imitation up top with a larva pattern dropped off the back. I end each dead drift by swinging my flies. The larva and pupae stages of these insects are most vulnerable life stages and big lazy trout catch on to this very quickly. Swinging your flies and adding a few rod tip twitches here and there does a great job of making your flies look like emerging bugs. 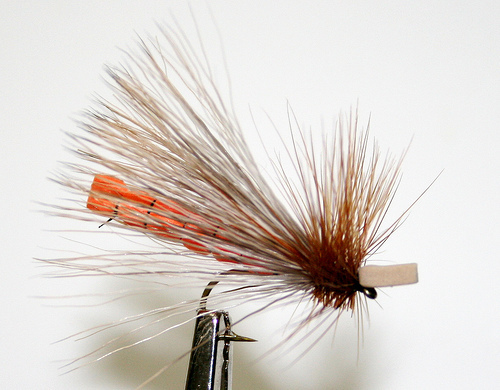 I’ve found this fly rig to be a great strategy for catching good numbers of fish before you start seeing adults out and about. You might be asking yourself why are you fishing a larva pattern, aren’t they in cases hiding among the rocks? I fish them because this species specifically, routinely free drifts as it matures and upgrades its case to the pupae stage, offering trout an easy meal. Once I’ve confirmed the hatch is in full swing, meaning pupae are emerging and adult laying caddis are active, I’ll switch from a nymph rig to a dry dropper rig. Using an adult dry fly with a pupa pattern dropped 24 inches off the back does a great job for both stages at the same time. By this time trout keyed in on this hatch have repositioned higher in the water column and are picking off both emerging pupae and egg laying females. Because egg laying females will often flop around on the surface depositing eggs, experimenting with skating your dry fly on the surface can often trigger aggressive takes. Below is a quick list of fly patterns that do a great job of imitating the larva, pupae, and adult stages of these two giant tent winged caddisfly species. This entry was posted in Fly Fishing, Fly Fishing Tips & Technique, Trout Fishing by Kent Klewein. Bookmark the permalink. I’ll be fishing these baby’s the early part of October on the McCloud….can’t wait, I’m excitied!! I’ll be out on the Green in a couple weeks, looking forward to it.